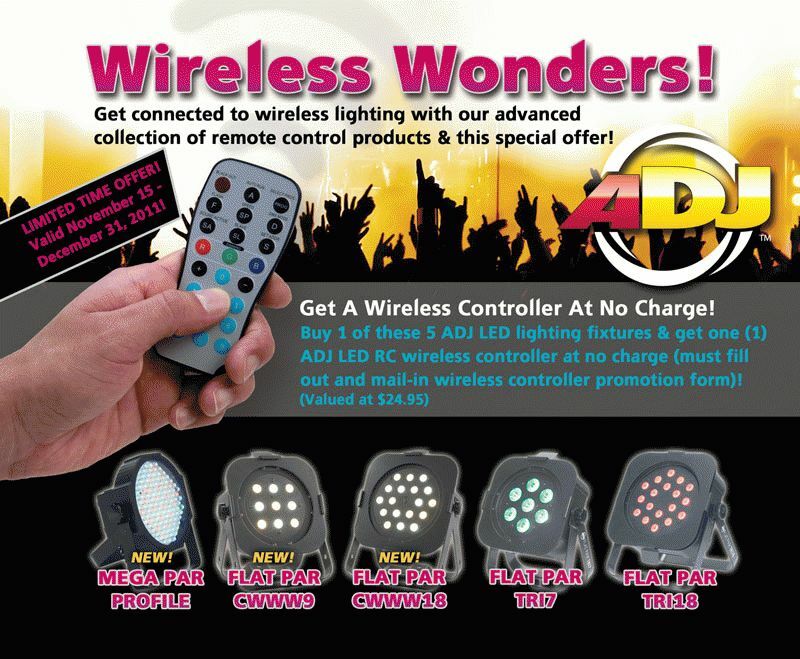 American DJ is making it easy for DJs, mobile entertainers and other lighting users to “go wireless.” The company is giving away a free ADJ LED RC wireless remote controller with the purchase of one of five compatible LED par fixtures: Mega Par Profile, Flat Par CWWW9, Flat Par CWWW18, Flat Par TRI7, or Flat Par TRI18. Anyone who purchases one of the above qualifying fixtures between November 15 and December 31, will receive an ADJ LED RC wireless infrared remote free of charge (a value of $24.95!). The ADJ LED RC is an easy-to-use handheld unit that allows users to control fixtures wirelessly from distances up to 30 feet, providing such functions as Blackout, Program Selection, RGB Color Adjustment, Strobing, DMX Addressing, DMX Mode, Sound Active Mode and more. uplighting and mounting inside truss. watt LEDs (9 x Cool White and 9 X Warm White). provide ultra smooth color mixing with no distractive RGB shadows. All mail-in promotional material must be postmarked before January 31, 2012. 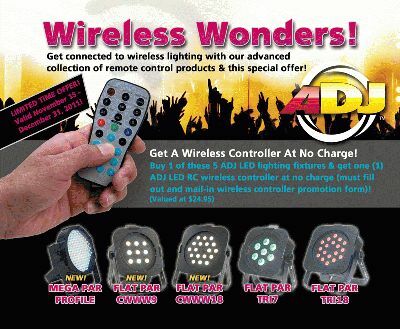 The promotion is valid only in the United States, and is limited to one free ADJ LED RC wireless controller per customer.